We’re incredibly excited to officially announce YTH Live 2017! Our annual conference will be held on May 7-9, 2017 in San Francisco, CA and feature the best in youth, technology, and health innovation. 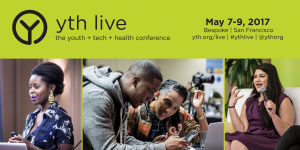 YTH Live brings together tech innovators, young leaders, researchers, funders and health professionals that work at the intersections of youth, tech, and health. Every year, we gather in San Francisco to learn, share, discuss, and collaborate on design and technology-based solutions for youth health. Last year, YTH Live was named one of the best non-profit conferences by EveryAction! YTH Live 2017 will be hosted at Bespoke, a unique coworking, demo, and event space located in the heart of downtown San Francisco. As a YTH Live attendee you’ll be closer than ever to some of the best sightseeing, and bay-area culture! In it’s ninth year, YTH Live continues to evolve as the premier conference where you discover cutting-edge technology, meet experts in youth innovation, and engage with visionaries and pioneers in the fields of public health, reproductive justice, and youth leadership. We’re very excited for YTH Live 2017 and hope you are, too! We look forward to seeing you at Bespoke on May 7-9, 2017. Register today and take advantage of early-bird discounts and follow us on Facebook and Twitter for additional details about becoming a presenter at YTH Live. tags: activism, digital storytelling, innovation, intergenerational leadership, leadership, Social Media, teen conference, youth, Youth Advisory Board, YTH Live, YTH Live 2016, YTH Live 2017.